One of the pieces I barely gave a glance when reading Feynman’s Lectures over the past few years, was the derivation of the non-spherical electron orbitals for the hydrogen atom. It just looked like a boring piece of math – and I thought the derivation of the s-orbitals – the spherically symmetrical ones – was interesting enough already. To some extent, it is – but there is so much more to it. When I read it now, the derivation of those p-, d-, f– etc. orbitals brings all of the weirdness of quantum mechanics together and, while doing so, also provides for a deeper understanding of all of the ideas and concepts we’re trying to get used to. In addition, Feynman’s treatment of the matter is actually much shorter than what you’ll find in other textbooks, because… Well… As he puts it, he takes a shortcut. So let’s try to follow the bright mind of our Master as he walks us through it. You’ll remember – if not, check it out again – that we found the spherically symmetric solutions for Schrödinger’s equation for our hydrogen atom. Just to be make sure, Schrödinger’s equation is a differential equation – a condition we impose on the wavefunction for our electron – and so we need to find the functional form for the wavefunctions that describe the electron orbitals. [Quantum math is so confusing that it’s often good to regularly think of what it is that we’re actually trying to do. :-)] In fact, that functional form gives us a whole bunch of solutions – or wavefunctions – which are defined by three quantum numbers: n, l, and m. The parameter n corresponds to an energy level (En), l is the orbital (quantum) number, and m is the z-component of the angular momentum. But that doesn’t say much. Let’s go step by step. First, we derived those spherically symmetric solutions – which are referred to as s-states – assuming this was a state with zero (orbital) angular momentum, which we write as l = 0. [As you know, Feynman does not incorporate the spin of the electron in his analysis, which is, therefore, approximative only.] Now what exactly is a state with zero angular momentum? When everything is said and done, we are effectively trying to describe some electron orbital here, right? So that’s an amplitude for the electron to be somewhere, but then we also know it always moves. So, when everything is said and done, the electron is some circulating negative charge, right? So there is always some angular momentum and, therefore, some magnetic moment, right? Well… If you google this question on Physics Stack Exchange, you’ll get a lot of mumbo jumbo telling you that you shouldn’t think of the electron actually orbiting around. But… Then… Well… A lot of that mumbo jumbo is contradictory. For example, one of the academics writing there does note that, while we shouldn’t think of an electron as some particle, the orbital is still a distribution which gives you the probability of actually finding the electron at some point (x,y,z). So… Well… It is some kind of circulating charge – as a point, as a cloud or as whatever. The only reasonable answer – in my humble opinion – is that l = 0 probably means there is no net circulating charge, so the movement in this or that direction must balance the movement in the other. One may note, in this regard, that the phenomenon of electron capture in nuclear reactions suggests electrons do travel through the nucleus for at least part of the time, which is entirely coherent with the wavefunctions for s-states – shown below – which tell us that the most probable (x, y, z) position for the electron is right at the center – so that’s where the nucleus is. There is also a non-zero probability for the electron to be at the center for the other orbitals (p, d, etcetera). In fact, now that I’ve shown this graph, I should quickly explain it. The three graphs are the spherically symmetric wavefunctions for the first three energy levels. For the first energy level – which is conventionally written as n = 1, not as n = 0 – the amplitude approaches zero rather quickly. For n = 2 and n = 3, there are zero-crossings: the curve passes the r-axis. Feynman calls these zero-crossing radial nodes. To be precise, the number of zero-crossings for these s-states is n − 1, so there’s none for n = 1, one for n = 2, two for n = 3, etcetera. OK. I said I would talk about states with some angular momentum (so l ≠ 0) and so it’s about time I start doing that. As you know, our orbital angular momentum l is measured in units of ħ (just like the total angular momentum J, which we’ve discussed ad nauseam already). We also know that if we’d measure its component along any direction – any direction really, but physicists will usually make sure that the z-axis of their reference frame coincides with, so we call it the z-axis 🙂 – then we will find that it can only have one of a discrete set of values m·ħ = l·ħ, (l-1)·ħ, …, -(l-1)·ħ, –l·ħ. Hence, l just takes the role of our good old quantum number j here, and m is just Jz. Likewise, I’d like to introduce l as the equivalent of J, so we can easily talk about the angular momentum vector. And now that we’re here, why not write m in bold type too, and say that m is the z-component itself – i.e. the whole vector quantity, so that’s the direction and the magnitude. Isn’t this fascinating? I’ve actually never seen this in a textbook – so it might be an original contribution. 🙂 OK. I need to get back to the grind: Feynman’s derivation of non-symmetrical electron orbitals. Look carefully at the illustration below. If m is really the projection of some angular momentum that’s “cocked”, either at a zero-degree or, alternatively, at ±45º (for the l = 1 situation we show here) – a projection on the z-axis, that is – then the value of m (+1, 0 or -1) does actually correspond to some idea of the orientation of the space in which our electron is circulating. For m = 0, that space – think of some torus or whatever other space in which our electron might circulate – would have some alignment with the z-axis. For m = ±1, there is no such alignment. You’ll say: so what? And you’ll also say that illustration in the bottom right corner suggests the electron is actually circulating around the z-axis, rather than through it. Well… No. That illustration does not show any circulation. It only shows a probability density. No suggestion of any actual movement or circulation. So the idea is valid: if m = 0, then the implication is that, somehow, the space of circulation of current around the direction of the angular momentum vector (J), as per the well-known right-hand rule, will include the z-axis. So the idea of that electron orbiting through the z-axis for m = 0 is essentially correct, and the corollary is… Well… I’ll talk about that in a moment. But… Well… So what? What’s so special about that Fl(r) amplitude? What can we do with that? Well… If we would find a way to calculate Fl(r), then we know everything. Huh? Everything? Yes. The reasoning here is quite complicated, so please bear with me as we go through it. The amplitude to find an electron whose state m is not equal to zero on the z-axis (at some non-zero distance r) is zero. We can only find an electron on the z-axis unless the z-component of its angular momentum (m) is zero. Now, I know this is hard to swallow, especially when looking at those 45° angles for J in our illustrations, because these suggest the actual circulation of current may also include at least part of the z-axis. But… Well… No. Why not? Well… I have no good answer here except for the usual one which, I admit, is quite unsatisfactory: it’s quantum mechanics, not classical mechanics. So we have to look at the m and −m vectors, which are pointed along the z-axis itself for m = ±1 and, hence, the circulation we’d associate with those momentum vectors (even if they’re the z–component only) is around the z-axis. Not through or on it. I know it’s a really poor argument, but it’s consistent with our picture of the actual electron orbitals – that picture in terms of probability densities, which I copy below. For m = −1, we have the yz-plane as the nodal plane between the two lobes of our distribution, so no amplitude to find the electron on the z-axis (nor would we find it on the y-axis, as you can see). Likewise, for m = +1, we have the xz-plane as the nodal plane. Both nodal planes include the z-axis and, therefore, there’s zero probability on that axis. In addition, you may also want to note the 45° angle we associate with m = ±1 does sort of demarcate the lobes of the distribution by defining a three-dimensional cone and… Well… I know these arguments are rather intuitive, and so you may refuse to accept them. In fact, to some extent, I refuse to accept them. 🙂 Indeed, let me say this loud and clear: I really want to understand this in a better way! But… Then… Well… Such better understanding may never come. Feynman’s warning, just before he starts explaining the Stern-Gerlach experiment and the quantization of angular momentum, rings very true here: “Understanding of these matters comes very slowly, if at all. Of course, one does get better able to know what is going to happen in a quantum-mechanical situation—if that is what understanding means—but one never gets a comfortable feeling that these quantum-mechanical rules are “natural.” Of course they are, but they are not natural to our own experience at an ordinary level.” So… Well… What can I say? It is now time to pull the rabbit out of the hat. To understand what we’re going to do next, you need to remember that our amplitudes – or wavefunctions – are always expressed with regard to a specific frame of reference, i.e. some specific choice of an x-, y– and z-axis. If we change the reference frame – say, to some new set of x’-, y’– and z’-axes – then we need to re-write our amplitudes (or wavefunctions) in terms of the new reference frame. In order to do so, one should use a set of transformation rules. I’ve written several posts on that – including a very basic one, which you may want to re-read (just click the link here). So this amplitude is the product of two amplitudes as measured in the the x’, y’, z’ frame. Note it’s symmetric: we may also write it as |l, m’ = 0〉·Fl(r). We now need to sort of translate that into an amplitude as measured in the x, y, z frame. To go from x, y, z to x’, y’, z’, we first rotated around the z-axis by the angle φ, and then rotated around the new y’-axis by the angle θ. Now, the order of rotation matters: you can easily check that by taking a non-symmetrical object in your hand and doing those rotations in the two different sequences: check what happens to the orientation of your object. Hence, to go back we should first rotate about the y’-axis by the angle −θ, so our z’-axis folds into the old z-axis, and then rotate about the z-axis by the angle −φ. The coefficient a is, as usual, a normalization coefficient so as to make sure the surface under the probability density function is 1. As mentioned above, we get these Yl,m(θ, φ) functions from combining those rotation matrices. For l = 1, and m = -1, 0, +1, they are: A more complete table is given below: So, yes, we’re done. Those equations above give us those wonderful shapes for the electron orbitals, as illustrated below (credit for the illustration goes to an interesting site of the UC Davis school). But… Hey! Wait a moment! We only have these Yl,m(θ, φ) functions here. What about Fl(r)? You’re right. We’re not quite there yet, because we don’t have a functional form for Fl(r). Not yet, that is. Unfortunately, that derivation is another lengthy development – and that derivation actually is just tedious math only. Hence, I will refer you to Feynman for that. 🙂 Let me just insert one more thing before giving you The Grand Equation, and that’s a explanation of how we get those nice graphs. They are so-called polar graphs. There is a nice and easy article on them on the website of the University of Illinois, but I’ll summarize it for you. 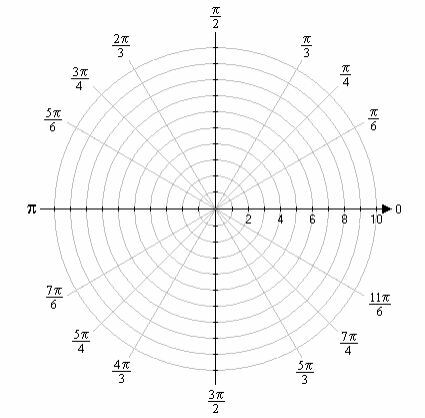 Polar graphs use a polar coordinate grid, as opposed to the Cartesian (or rectangular) coordinate grid that we’re used to. It’s shown below. The origin is now referred to as the pole – like in North or South Pole indeed. 🙂 The straight lines from the pole (like the diagonals, for example, or the axes themselves, or any line in-between) measure the distance from the pole which, in this case, goes from 0 to 10, and we can connect the equidistant points by a series of circles – as shown in the illustration also. These lines from the pole are defined by some angle – which we’ll write as θ to make things easy 🙂 – which just goes from 0 to 2π = 0 and then round and round and round again. The rest is simple: you’re just going to graph a function, or an equation – just like you’d graph y = ax + b in the Cartesian plane – but it’s going to be a polar equation. Referring back to our p-orbitals, we’ll want to graph the cos2θ = ρ equation, for example, because that’s going to show us the shape of that probability density function for l = 1 and m = 0. So our graph is going to connect the (θ, ρ) points for which the angle (θ) and the distance from the pole (ρ) satisfies the cos2θ = ρ equation. There is a really nice widget on the WolframAlpha site that produces those graphs for you. I used it to produce the graph below, which shows the 1.1547·cos2θ = ρ graph (the 1.1547 coefficient is the normalization coefficient a). Now, you’ll wonder why this is a curve, or a curved line. That widget even calculates its length: it’s about 6.374743 units long. So why don’t we have a surface or a volume here? We didn’t specify any value for ρ, did we? No, we didn’t. The widget calculates those values from the equation. So… Yes. It’s a valid question: where’s the distribution? We were talking about some electron cloud or something, right? Right. To get that cloud – those probability densities really – we need that Fl(r) function. Our cos2θ = ρ is, once again, just some kind of envelope function: it marks a space but doesn’t fill it, so to speak. 🙂 In fact, I should now give you the complete description, which has all of the possible states of the hydrogen atom – everything! No separate pieces anymore. Here it is. It also includes n. It’s The Grand Equation: The ak coefficients in the formula for ρFn,l(ρ) are the solutions to the equation below, which I copied from Feynman’s text on it all. I’ll also refer you to the same text to see how you actually get solutions out of it, and what they then actually represent. 🙂 We’re done. Finally! I hope you enjoyed this. Look at what we’ve achieved. We had this differential equation (a simple diffusion equation, really, albeit in the complex space), and then we have a central Coulomb field and the rather simple concept of quantized (i.e. non-continuous or discrete) angular momentum. Now see what magic comes out of it! We literally constructed the atomic structure out of it, and it’s all wonderfully elegant and beautiful. Now I think that’s amazing, and if you’re reading this, then I am sure you’ll find it as amazing as I do. Note: I did a better job in explaining the intricacies of actually representing those orbitals in a later post. I recommend you have a look at it by clicking the link here. You must find the explanation for that 〈l, 0|Ry(θ) Rz(φ)|l, m〉·Fl(r) product highly unsatisfactory, and it is. 🙂 I just wanted to make you think – rather than just superficially read through it. First note that Fl(r)·|l, m’ = 0〉 is not a product of two amplitudes: it is the product of an amplitude with a state. A state is a vector in a rather special vector space – a Hilbert space (just a nice word to throw around, isn’t it?). The point is: a state vector is written as some linear combination of base states. Something inside of me tells me we may look at the three p-states as base states, but I need to look into that. Let’s first calculate the Ry(θ) Rz matrix to see if we get those formulas for the angular dependence of the amplitudes. It’s the product of the Ry(θ) and Rz matrices, which I reproduce below. Given that our atom is in the |l, m〉 state, what is the amplitude for it to be in the 〈l, 0| state in the x’, y’, z’ frame? That makes sense – because we did start out with the assumption that our atom was in the the |l, m〉 state, so… Yes. Think about it some more and you’ll see it all makes sense: we can – and should – multiply this amplitude with the Fl(r) amplitude. This entry was posted in Mathematics, Physics, quantum mechanics and tagged angular dependence, angular dependence of amplitudes, electron orbitals, hydrogen atom, Schrödinger equation. Bookmark the permalink.